The third of Valiant Entertainment's named relaunches could be firing the biggest bullet in the chamber, thanks to the fact Bloodshot will be returning not only with a new ongoing series (alongside the previously announced X-O Manowar and Harbinger), but his own live-action Sony blockbuster as well. "Every mission is a suicide mission" ties back into the felling of Bloodshot's original series where one of the mob's top hit-men, betrayed while under witness protection, is thrust into an experimental program - filling his body with strength-enhancing and regenerative enabling nanites, at the cost of his memory. 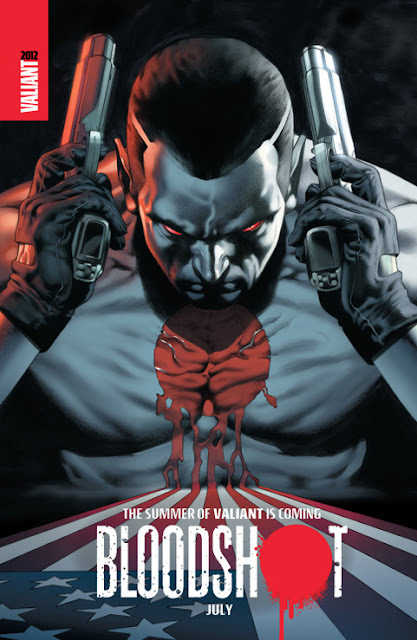 A blank slate in more ways then one, 'Bloodshot' went on an action-packed journey to discover who he was as 'Angelo Mortalli' and to become a better and deadlier force for good in the process. How closely the named mediums will follow the original premise is still unknown, along with the title's creative team. Hazarding a guess. I'd say Daredevil artist David Aja has been a talented man quiet for too long. Maybe his 'vacation' has been basking in the 'Valiant Summer' ahead. It seems Valiant is coming back really strong..looking very much forward to bloodhot ever since i saw David Aja's variant cover teaser. I am more excited about the on-going series than the movie which i hope they make it right. Hey IFF! Yip Valiant sure seems like they're stamping their ground good and proper in 2012. Hopefully down the road they get their hands back on Turok, and creating some all new series in the Valiant vision style!